Royal Oak has had a number of banks, few of which survive. Most failed during the Great Depression. A trying era through which although I did not live, one that I have heard so much about from the previous generation. Like many people, my great grandmother Eliza Knowles lost most of her savings in the failed banks. She had sold her land between Farnum and Austin, and Washington and Maxwell to the School District in 1925 for nearly $50,000, most of which was in the banks in 1930. She recovered just a few pennies on the dollar. Recall, this was at a time when you could buy a house for less that $5,000! The first bank in the area was the Farmers Bank of Oakland, which was in business in the township after 1838. It had a short life as the Panic of 1837 did not encourage banks. We know little more about it. Its notes are now collector's items. Main Professional Building, northwest corner of Main Street and Fourth (ca. 1920s). Thanks to Don Lance for graphic. It was not until 1907 that the next local bank, the Royal Oak Savings Bank, was established. It was located on the southeast corner of Main at Fourth Street, operating in a section of a store. In 1916 it moved katty-corner across the street to a new building (Main Professional Building), and later to its final location at the southwest corner of the same intersection in an imposing edifice. In 1930 the name was changed to Royal Oak State Trust and Savings Bank. It closed its doors during the Great Depression on the Bank Holiday, June 12, 1931. Royal Oak Savings Bank, 2 views from old postcards. Located at the Southwest corner of Main Street at Fourth, the Distinctive Building was later home to the Wayne-Oakland Bank, and more recently First of America Bank. The building is now threatened with demolition ("redevelopment"). Graphics thanks to Dorene Anderson. The First Commercial Bank was established on the northeast corner of Fourth and Center on March 13, 1913. In 1914 it moved to Washington Avenue south of Fourth, where on May 18, 1920 the name was changed to First State Bank of Royal Oak. The new bank building at the southeast corner of Fourth and Washington was opened to the public March 10, 1922. A beautiful bronze clock jutting out at the corner of the building became a landmark for people to "meet under" at a given hour. This bank closed in January, 1931. The site later housed Kinsells, and then Klebba's until a few years ago. First State Bank Building at Washington and Fourth Street (ca. 1946). Graphic thanks to Therese Clawson Christman. 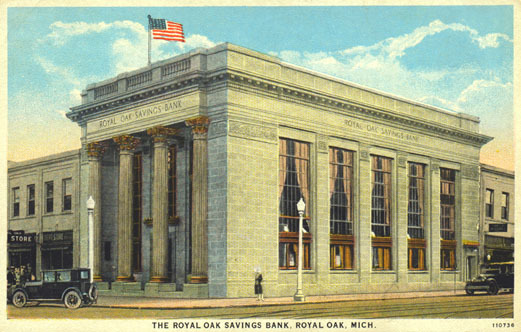 On Jan. 1, 1931 the Royal Oak State Trust and Savings Bank and the First State Bank of Royal Oak merged. Nevertheless, the consolidated bank closed its doors for good June 12, 1931. 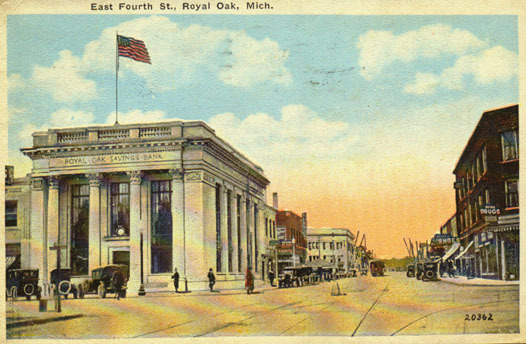 The First National Bank of Royal Oak was opened March 25, 1925 at 309 South Main Street. A principal stockholder was J.J. Levy, later of Oakland County Gas and Oil Company fame. It moved to its new building at the southwest corner of Main and Third May 31, 1928. This bank also collapsed at the time of the 1931 Bank Holiday. The handsome building housed the Royal Oak Public Library during my youth. Thus, within a period of six months there was not a bank left in Royal Oak. The few people with money had to go to Woodward near Six Mile to do their banking. 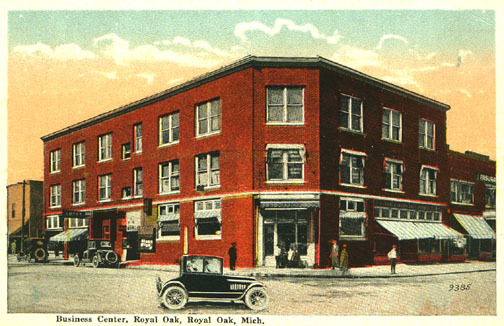 The Greater Royal Oak Savings Association opened February 5, 1925. It was at 422 South Main and lasted a little longer than the other banks, finally shutting its doors October 1, 1938. The Guardian Bank of Royal Oak was founded September 19, 1931. In December of 1939 it merged with the Highland Park Trust Company, the new name becoming the Wayne-Oakland Bank. It used as its home office the building formerly occupied by the Royal Oak State Trust and Savings Bank on the southwest corner of Main and Fourth. Eventually the Wayne Oakland Bank had six branch offices in Royal Oak and six more in neighboring communities. Its facilities were greatly expanded over the years. The name was changed to First of America about ten years ago. In 1938, toward the end of the Depression, Peoples Federal Savings and Loan Association was opened on Main Street. In January of 1950 the name was changed to Royal Oak Federal Savings and Loan Association. Six years later it merged with First Federal Savings of Detroit. A branch office of the firm is now located at the southwest corner of Main and Second Avenue. The Standard Federal Savings and Loan Association formed some years ago, recently changed its name to Standard Savings Bank. The National Bank of Royal Oak is of more recent vintage. It was formed April 2, 1956 with offices near the southeast corner of Main and Fourth. The recently expanded (raised) main office of this bank is now at the northeast corner of Center at Third, a site occupied for more than forty years by the First Congregational Church building. All the other banking and savings and loan institutions in Royal Oak are branches with head offices in another city.